An antiseptic and anti-fungal skin dressing for horses and cattle to be used on skin irritations and ringworm. When should I use Pottie’s Green Ointment? Pottie’s Green Ointment is an antiseptic, antifungal ointment that can be used on all fungal infections and skin irritations, such as ringworm, greasy heel, mud fever, rain scald etc. It is also very effective in the promotion of hair growth where the horse or cow has suffered hair loss, and in softening the proud flesh. How do I use Pottie’s Green Ointment? 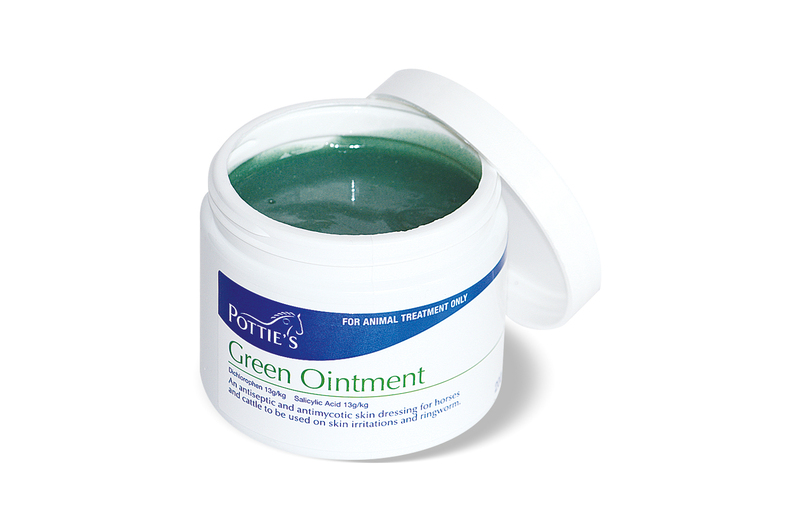 Pottie’s Green Ointment should be thoroughly applied to the affected part, once daily.